Young Lucinda ‘Cindy’ has been on the move with her family since the dust bowl destroyed their home. They return to the sugar beet farm as migrant workers, all they own in their worn out car, 9 total in the family. Harsh work conditions, poor living facilities and nearly always hungry that seems to be the way her family is going to have to continue to live. A carnival comes to town bringing Bo who is intrigued by Cindy and befriends her. Cindy begins a job with the farm boss helping his wife and running the migrant store. Something tells Bo that this boss isn’t on the up and up as he sees him stare at Cindy with greedy eyes. Bo comes to pick her up one day after work and finds Cindy via her screams. A hustle and bustle leaves the farm boss dead, and Cindy and Bo grabbing for the past wages due her family, on the run. With the police looking for them, they make their way to Canada and try to make a go of it, Cindy now Lucy, always feeling quilt for leaving her family and taking the money. 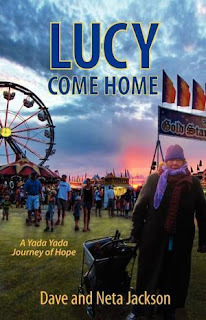 This book goes back and forth from Cindy’s time as a migrant worker up until she is recently married, to Lucy as an 80 year old homeless woman. Back and forth we begin to piece together Lucy’s story and how she came to be homeless. Lucy, on her own has not had the opportunity to make friendships and has been far from the God of her youth. Maybe Lucy is softening as she begins to make some friends in the homeless shelter of Chicago. This was a great story. I loved how it started with Cindy as a 15 year old girl and then left us guessing to how she became Lucy an 80 year old homeless woman. It made me think, we really don’t know how people get to be the way they are. We may see homeless folks or even those down on their luck, and never consider that there is a story behind that. Perhaps they just need someone to come alongside them, or maybe they need to find their own forgiveness. It was almost like we were able to watch Cindy become Lucy in the story and learning how she got there, helped us to understand why she was the person she had become. You laugh with Lucy and cry with her at what she has lost in the course of her life. You also rejoice in the newness she finds. Wonderful story by Dave and Neta Jackson! Once again, Neta and Dave Jackson have given us a winner! I'm a huge fan of their writings and am delighted to share this book with friends and family. When I first heard the title I wasn't too sure there'd be much to Lucy's story but oh how wrong I was!! This book is both entertaining, heart-tugging, and even leaves you a bit teary-eyed. Once you pick it up, you can't put it down! I have read all of their series and can't wait for the next one!!! !